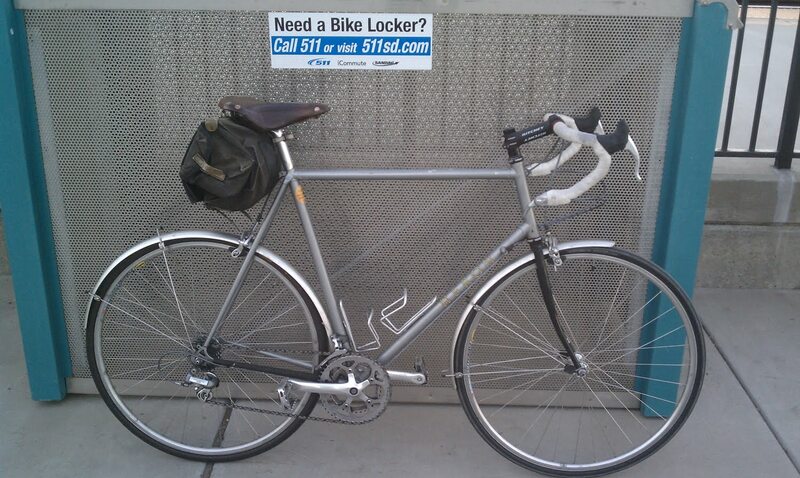 A six-month break from cycle commuting has ended. A multitude of reasons exist for the break, but let me sum by saying I was not ready to resume cycling as a daily grind, while at the same time the break inspired me to do what it took to resume that "grind". Prior to resuming my minimal cycle commute, I took the opportunity to walk to my train station from work. 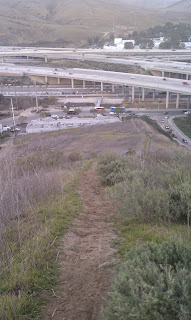 The highlight of this walk is a very steep descent from the Pfizer complex to the station itself. 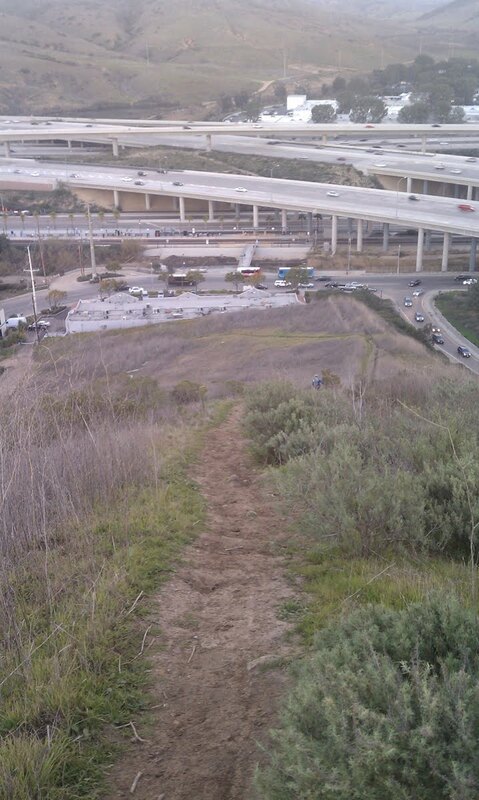 In this pic you can kinda get a sense of the steepness (that's a mountain biker walking down in front of me) of the trail and also a birds-eye view of the Sorrento Valley Coaster Station. However, cycling to the station is much more time efficient, even when including the time to change into silly bike clothes. The route profile reveals the reason for this efficiency. 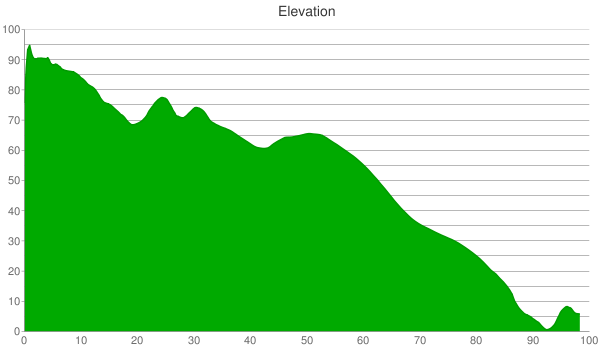 Of course, the opposite profile greets the morning ride, but isn't that how it should be? A struggle to arrive at work, but a gravity-fueled release when the work day is over? 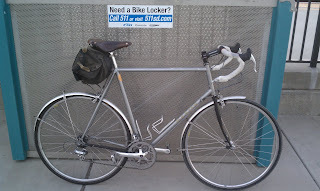 And when it is, the bike has to be secured for the evening, and I secure it in locker #17 on most evenings (I have a thing for prime numbers). During my hiatus, I got a new electronic locker card since my four-year old one was worn out, and I have more confidence leaving my bikes in these lockers--and being able to retrieve them! 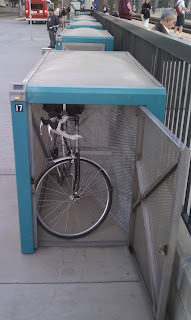 These are BIKELINK lockers, which operate differently in the Bay Area than in San Diego, but are superior to the eLockers that they replaced. Great to see you back in the blogosphere and back on the roads! Here's to a grinding great year in 2011. Your bike looks so clean! Keep posting pics!